THE DARDANELLES. ALLIES IN GALLIPOLI. 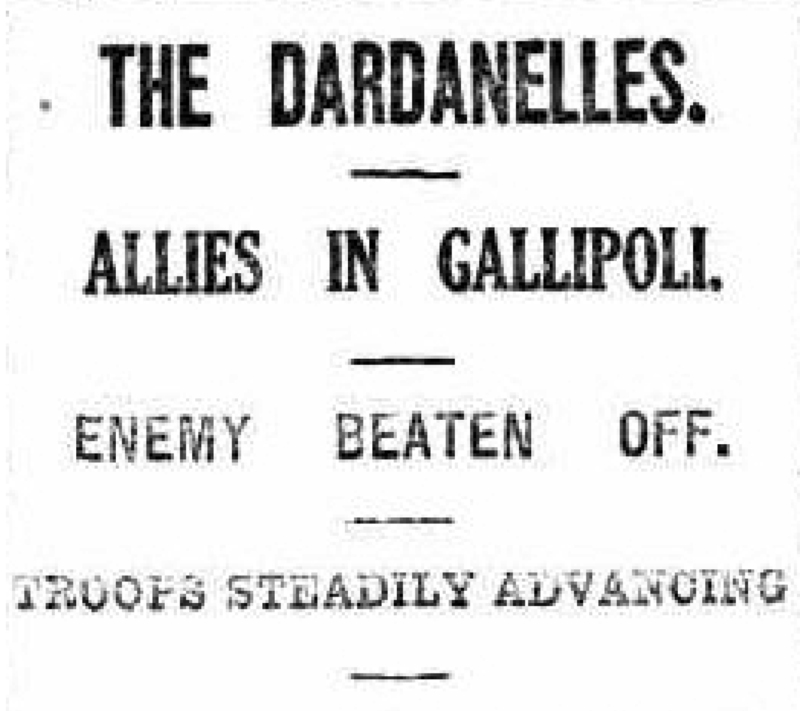 (1915, April 30) Bendigo Advertiser (Vic) p. 7. Newspaper article found in Trove reproduced courtesy of the National Library of Australia. 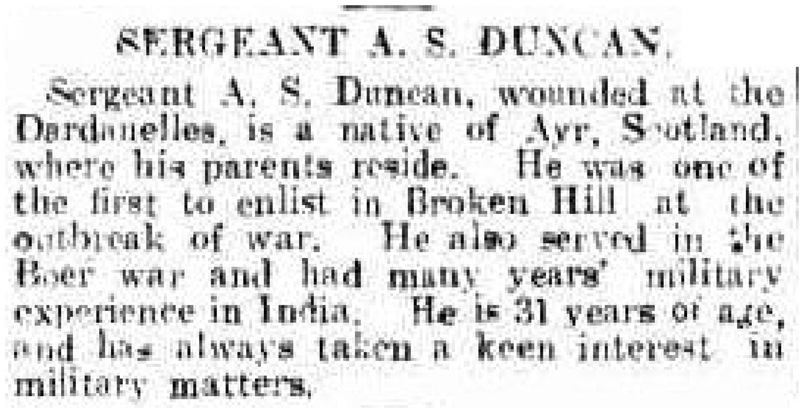 In the early hours of 25 April, Andy Duncan was on board a destroyer – possibly the Scourge – anchored about 5 miles from the Gallipoli shore. A hot breakfast and a tot of rum gave some comfort in the chill night air. The NCOs including Andy were responsible for enforcing the rules of no noise, no lights, no smoking while the men waited for the moon to set and orders to embark. At 3AM on Sunday 25th April B & D Coy & Hd Qr Battn Staff Signallers & Scouts left the Prince of Wales in cutters life boats &c being towed to within about 50 yd of shore by steam boats. Absolute silence was maintained by all in our boats & directly the boats were cast off by the steamers we quickly rowed towards the shore. Dawn was just breaking 4.15 & no sound was heard except the splash of the oars. We thought that our landing was to be effected quite unopposed, but when our boats were within about 30 yd of the beach a rifle was fired from the hill in front of us above the beach, right in front of where we were heading for. Almost immediately heavy rifle & machine gun fire was opened upon us. We had to row for another 15 yards or so before we reached water shallow enough to get out of boats. This was about 4.15 AM – we got out of boats into about 3 ft of water & landed on a stony bottom. The stones were round & slimy & many officers & men slipped on them & fell into the water, but all bravely & silently made all haste to reach the beach, under a perfect hail of bullets. Many men fixed their bayonets before reaching the shore. I ordered the men to lay down, fix bayonets & remove packs. This was done in a couple of minutes. The men of 9, 10 & 11 Bn were all mixed up on the beach but there was no time to organize so I ordered all to advance. The men sprang to their feet at once & with a cheer charged up the hill held by the Turks & drove them off it, following up their success by firing on the quickly retreating foe. For the next 96 hours the men of the 10th Battalion experienced continuous fighting, shattered nerves and little or no sleep. If Andy was with the parts of his battalion fighting around 400 Plateau, then he was where the shrapnel was the heaviest. Shells burst just above the Australians. Red-hot pellets whipped through the air, flaying the unprotected backs of the men as they sought cover from enemy rifle and machine-gun fire. He was ferried from the beach out to the ship Ionian with severe shrapnel wounds to his back. Medical staff on board classified the wounds of the soldiers arriving, sending the dead and those beyond help to a makeshift morgue in the ship’s hold. Andy’s condition was assessed. He heard a voice say, “put him in the hold”. As Andy was being consigned to the morgue he managed to say, “Give us a bloody drink”. Those words probably saved his life. He was moved to lie with the wounded. Plowman, P. 2013. Voyage to Gallipoli. Rosenberg Publishing, Kenthurst, NSW. 1915 AWM4, 23/27/2 – March – April 1915. 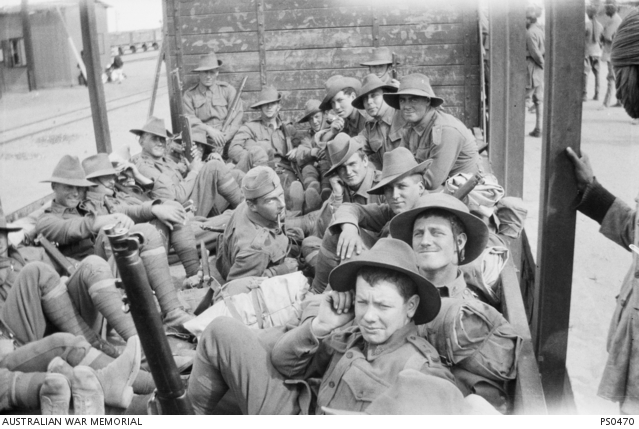 First World War Diaries – AWM4, Sub-class 23/27, 10th Infantry Battalion. Pedersen, P. 2010. 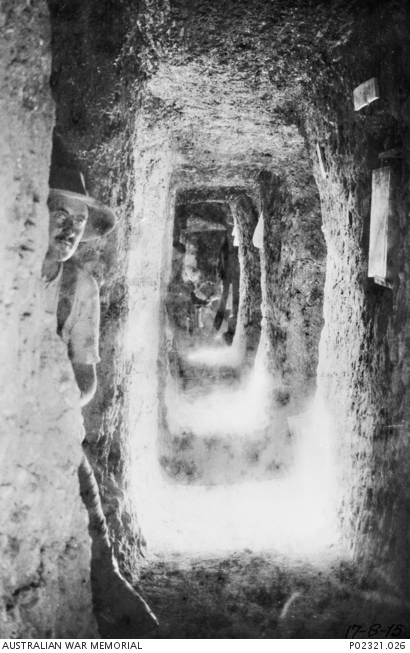 The Anzacs: From Gallipoli to the Western Front. Penguin Australia. Two sons dead at Mena Camp within days of each other. Sadly deaths like these were not unusual. The soldiers would return from drills soaked with sweat; the desert winds would then chill them and put them at risk of pneumonia. 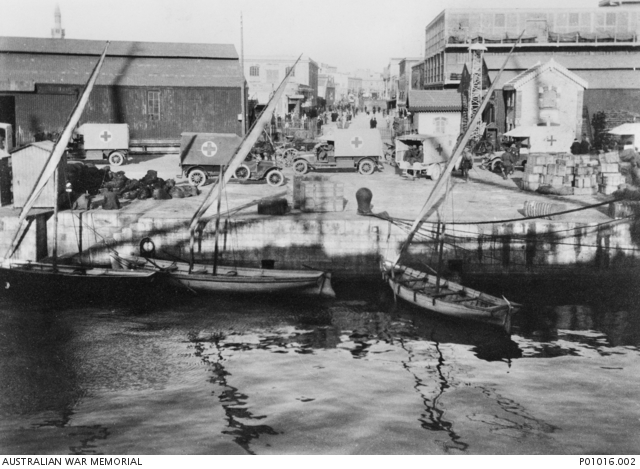 On 6 December 1914 the 10th battalion disembarked at Alexandria and entrained for Cairo. The men arrived in Cairo around midnight and were given a mug of cocoa, a bread roll and cheese. Then they boarded trams for Mena camp. As the trams neared the terminus, the men could see the pyramids in the moonlight, wrapped in light fog. The battalion marched into camp only to find no tents, blankets or bedding. Exhausted from the day’s activities, the men fell asleep on the sand. The desert night was freezing, and Andy had only his greatcoat to keep him warm. A second night was spent sleeping in the open – this time huddled under waterproof sheets in the rain.The following day the tents arrived. The NCOs would have been kept busy establishing discipline and routine. Andy would have had to deal with men more interested in climbing the pyramids or seeking out the delights of Cairo than in military routine. For the next three months the battalion underwent vigorous training at Mena camp. A typical day started with Reveille at 6am then breakfast at 7am. After breakfast the men marched for about four miles across the desert to the drill ground. There they would rest for ten minutes before drilling until 12 noon. Lunch was a small bread roll and tinned sardines. 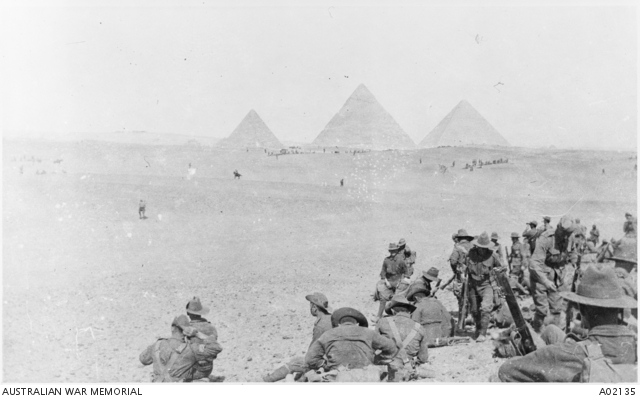 Troops of the 10th Battalion taking a rest break during training in the desert. In the afternoon the men drilled from 1pm until 4pm. Then they headed back to camp. They wore full kit, marching and skirmishing their way through the desert.By the time Andy arrived in camp his clothes were soaked through with sweat. After dinner the men would wash and change clothes, then drill from 7:30pm until 10 or 11pm. At the beginning of January 1915 the battalion structure changed from 8 companies to 4. Andy’s G Company was disbanded and he was now in D Company. About this time the ‘Australian Expeditionary Force’ was renamed the ‘Australian Imperial Force’. By February night drills had lengthened. Soldier Archie Barwick wrote of practising at night “taking up positions, digging trenches, attacking, scouting, silent marches, bayonet attacks, rapid movements”. On 2 March 1915 Andy left with the battalion on the S.S. Ionian for the island of Lemnos. Here they would make their final preparations for a landing at the Dardanelles. 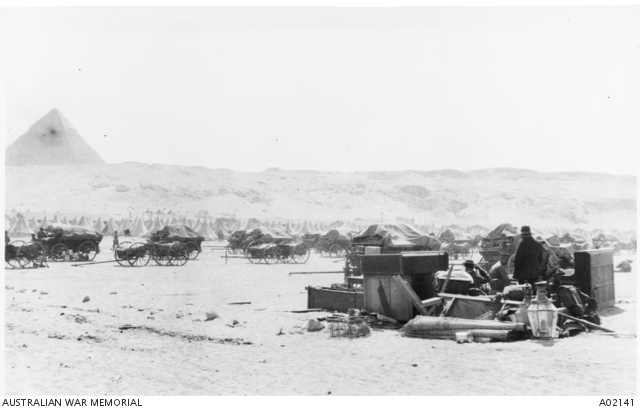 The 10th Battalion camp lines at Mena ‘packed up ready to move’ on the eve of departure for the Gallipoli Peninsula. The remains of the Officers mess is in the right foreground.